...in one way or another. Swedes with their crayfish eating is just another example of this interesting habit. Eating together is often a healthy family tradition. Eating crayfish is just one of the best of these healthy traditions. While Americans gather around a barbeque for hot dogs or hamburgers, Swedes sit down for a helping or two of crayfish. At least, that's what they would like to do. Eating crayfish has long been a very seasonal affair in Sweden. As a child I remember how August 7 was the day when finally you were allowed to go out to your favorite lake to throw in some traps and catch crayfish. But like so many traditions in our lives, they change as time goes by. 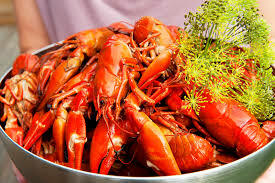 The introduction of the freezer suddenly made Swedes realize that although you couldn't catch crayfish in December, you could certainly eat them if you had a freezer full of these delicacies. Add to that that many crayfish nowadays are imported from countries that have no seasonal restrictions. So, if crayfish come from California, Turkey or China in the middle of winter, why not eat them in the middle of winter? Regulations finally changed even for the formal and law-abiding Swedes. Now you can catch crayfish whenever you want, and the eating goes along with it. However, a word in defense of the old restrictions. At least I was told that the reason you could then not fish for crayfish until August 7, was to make sure that you did not catch any pregnant female crayfish which could reduce the potential for further crayfish in the lake. And Swedes want to increase the number of crayfish in their lakes. This is contrary to some US states that consider crayfish an ecological threat to certain native species. Consequently some states, including Arizona, encourage people to catch as many crayfish they can while some states, such as Oregon and Missouri, protect their crayfish with seasons and catch limits. There is really no reason why you have to eat crayfish the way the Swedes do it. Unless you are a Swede like me. There are many great recipes - see the menu for crayfish recipes - for cooking and eating crayfish that are very different from those I was brought up to like. So don't take my word for it. Crayfish can be enjoyed in may different ways. Now I' ll just describe the way I happen to like them. Without any ethnic bias, of course! One of the main differences you notice is that Swedes eat their crayfish cold. I can tell you one good reason for that. Crayfish just cooked have not had time to soak up the flavors of what herbs and spices you put in the boil. I like to add lots of the dill herb, again just a tradition. Cooking crayfish with large amounts of dill permeates the house with a delightful aroma that turns Swedes extatic. Just like cats with catnip. And I have found that crayfish that have steeped in their brine for at least 24 hours, and preferably more, taste much better than those just cooked. Crayfish connoisseurs, in Sweden of course, turn up their noses at 'freshly cooked crayfish' knowing that they taste much better after a few days. Let's get down to actually eating crayfish, the Swedish way. (Of course, even Swedes have some individuality, and all of them don't always eat crayfish the same way.) 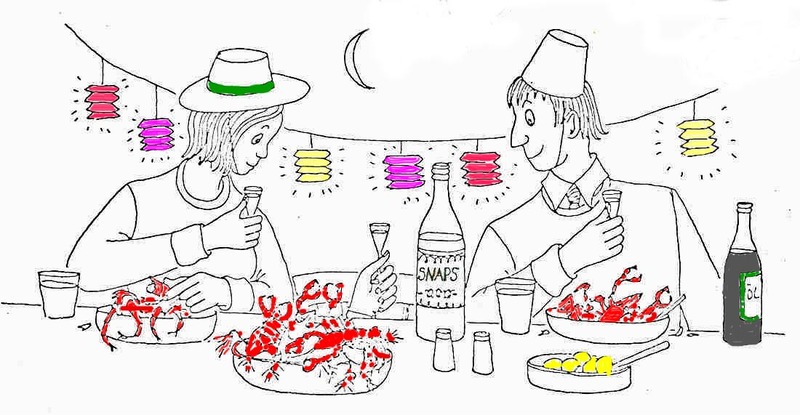 So, let's talk about an imaginary traditional Swedish crayfish party. Yes, when they get together to eat crayfish, it's a party. You hardly ever find Swedes eating crayfish alone. Only some dyed-in-the-wool like me do it alone. Eating crayfish is a special occasion, let's first agree on that. You invite some of your best crayfish eating friends and you decide in advance to have a very special occasion. You set up a table that is clearly special. 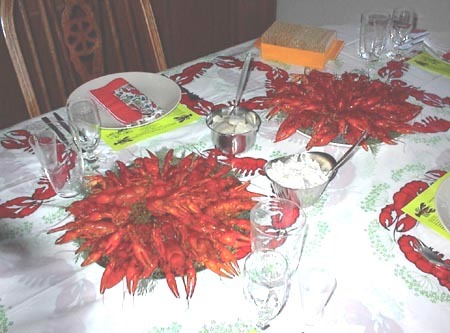 A table cloth with decorations of crayfish is a must. From the ceiling you hang colorful lanterns and each table setting has its own table mats, also in colorful crayfish motif. Each member at the party is supplied with a crayfish bib and some crazy hats. Not that you need it to enjoy the crayfish, but it makes it a special occasion. Now to the actual menu. First, of course, crayfish, cold and red and with that lovely odor of dill. Dill is used not only to cook the crayfish, but also as decoration. And the more dill, the better. 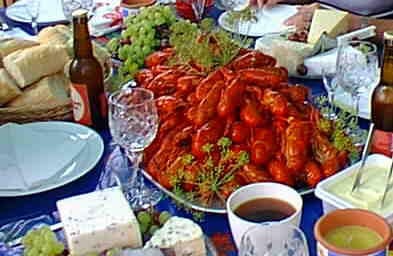 A large platter in the middle of the table filled with crayfish turns every Swede nostalgic. That's the tradition of it. But what do you eat with crayfish? Some serious crayfish eaters answer simply, nothing! They eat nothing but crayfish. Well, maybe a few additions like toasted bread and butter with herring tidbits. But no crayfish party would pass its muster without akvavit or white wine. Each table setting has glasses for both beer and akvavit (which people know is just a Swedish kind of vodka.) The beer, some say, is to wash down the akvavit. Swedes are a nation of inventors. Some invented and built the Civil War Monitor. 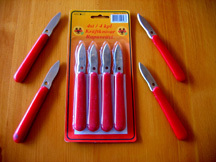 Others invented the crayfish knife. To get to the meat of a crayfish, you need a special tool to fish out what the claws hide and the Omega 3 Fatty Acids encased on the inside of the main shell. 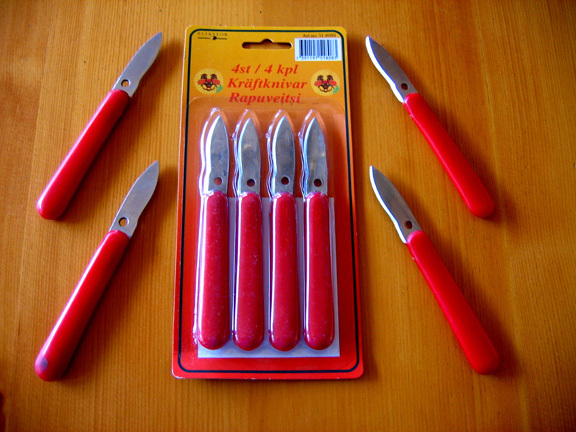 Perfect also to shell the tail and to pick out the sand vein if you have the Swedish CRAYFISH KNIFE. When Swedes throw a crayfish party, the whole neighborhood knows it. Crayfish eating Swedes can be heard far and wide and down the street. And why? One very important detail in any crayfish party in Sweden, is the singing. Yes, you have to sing before you take a drink. That's the prerequisite. Everybody takes it for granted that of course you sing before you drink. The traditional song that always starts a crayfish party is called HELAN GOR, which in free translation means, here goes the first one. And make no mistake about it, there will be several more. To top off the party, after all the crayfish are eaten, a light dessert is served consisting of maybe fruit or a light cheese cake. Some dyed-in-the-woolers skip that and look forward to coffee and liquers. Personally I go for Kalua. When people get together to eat crayfish in places like Sweden, the setting can be anywhere from semiformal to very, high-falutin formal. The Louisiana Cajuns have their crayfish traditions and I have mine. We get along just fine. I am still waiting for an invitation to a bash of crayfish served on newspapers on the bayou in Louisiana. While waiting, I enjoy my crayfish the Swedish way.